Having the best taxi dash cam is not just necessary for your safety, but to your passenger’s safety as well. They are a primary product that has grown in popularity over the past decade and can protect you from things such as unruly passengers, accusations and assaults, accidents, and fraudulent insurance claims. As such, we’ve taken a look at three cameras to determine what dash cam is perfect for your taxi. 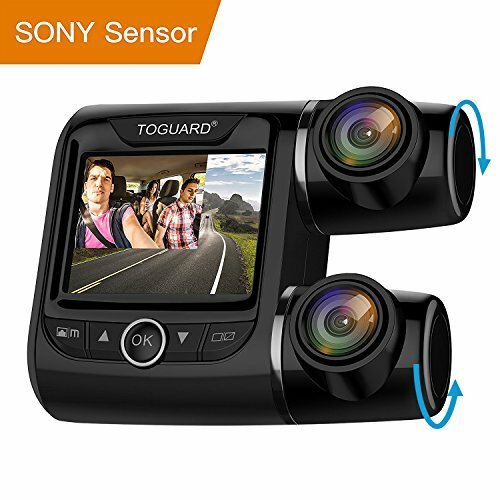 ToGuard Electronics Co. is a manufacturing company based out of China, and they specialize in not just dash cameras, but other security and portable digital equipment. They have a dedicated design team that creates innovative products for the public and businesses, and their products are sold at affordable prices. That is the main reason the ToGuard Uber Dual Dash Cam is first on our list. The Toguard Uber Dual Dash Cam combines both front and rear view cameras that come equipped with the advanced Sony Exmor IMX323 sensor. The software ensures that your camera records the front and rear of your vehicle simultaneously, with clear quality that provides peace of mind. There is a 340-degree wide-angle, and the cameras can rotate at 270 degrees. The wide angle is ideal for capturing license plates in crucial situations, and the inside camera works in low-lighting conditions. It also has a continuous loop setting, so it automatically rewrites the oldest footage that gets stored in your memory card, so you don’t need to worry about space. The included G-sensor is an incredible feature that ensures any footage captured during sudden harsh braking or bumping gets locked in and saved. There are no suction cups required to adhere the dash cams; instead, Toguard comes with 3M adhesive stickers. The Vantrue brand is highly innovative, creative, and determined to produce some of the highest grade dash cameras on the market. They offer a wide range of cameras in their line, and while the Vantrue N1 Pro Mini isn’t as new as their N2 series, it’s one of their top sellers and our choice for the second review in our best taxi dash cam competition. 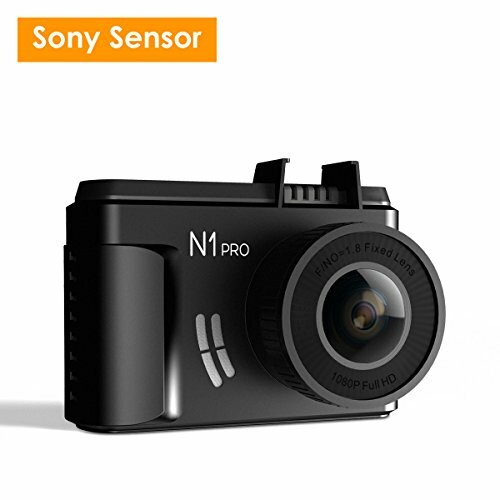 The Vantrue N1 Pro Mini Dash Cam includes the advanced Sony Sensor IMX323, with F1.8 six layer glass lens that provides optimal image quality during the night and day. It has a 160-degree angle that ensures you’re covered in the case of an accident. The G-Sensor and loop recording feature also boost the utilization of the camera. The G-Sensor works to ensure your footage gets stored during a sudden brake, shake, or collision and the loop recording overwrites clear, old footage when memory card space runs out. There is also an integrated motion activated parking mode that allows your mini dash camera to record automatically when movement is picked up near your vehicle. It does need to get connected to the car battery or battery pack when it’s parked. Additionally, the Vantrue N1 Pro Mini Dash Cam is heat-resistant and includes an optional GPS function, so you can easily track your driving route and distance. Lastly, the built-in mic provides excellent sound quality that picks up voices even in loud environments. E-Ace isn’t as well known as the other two brands that we included in our review, but we decided to give them a chance. They are an e-commerce brand that sells a variety of products through their platforms. 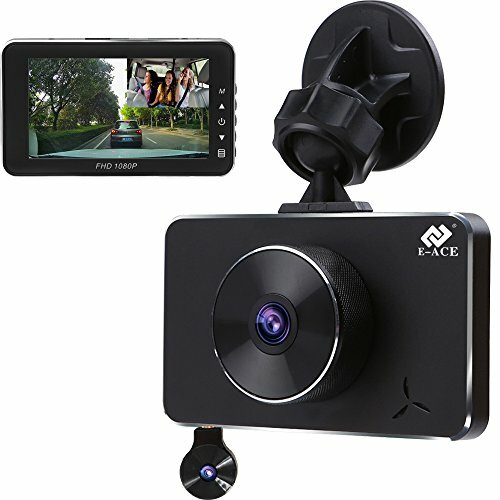 The E-Ace Dual Lens Dash Cam is just one of many that they have to offer, which is highly recommended for both personal, taxi, and ridesharing use. Let’s take a look at the features it has to offer, the pros, cons, and how it compares to the two models. The E-Ace Dual Lens Dash Cam includes the industry-leading Novatek 96658 chipset, along with the Sony Exmore software that helps with capturing clear, precise images during day and night. The camera has a 310-degree angle and can rotate at an impressive 360 degrees. It comes with a three-inch display screen that has an alloy shell. Other features that the E-Ace Dash Cam have include G-Sensor, which takes and locks footage when triggered by a sudden brake, a hard bump, or a collision. Additionally, it consists of an emergency lock, a motion detector, a night vision, a parking monitor system, and continuous loop recording. Attaching the dash cam to your windshield can be done in two ways. You can use a suction cup or a 3M adhesive sticker. There is also a 45-day money back guarantee in addition to a 12-month product warranty that ensures E-Ace and their customer service team stands behind their product. We wanted to give each of the three models we reviewed a chance, but admittedly, we did think that our choice for the best dash cam was going to be one of the first two. However, once we started exploring and using the dash cams, we concluded that the E-ACE Dual Lens Dash Cam is the best taxi dash cam. All of the features that it comes with ensure that both you and your passengers are going to have a safe and comfortable ride, whether it’s day or night. It’s reasonably priced, adequately designed, and a pleasant surprise. Sometimes you really do benefit by taking a chance on the unknown.